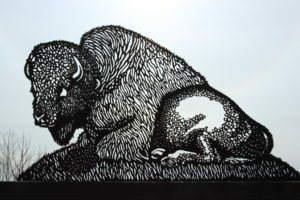 Inspired by the strength and the symbolism of the mighty bison, Joe Fafard’s piece entices viewers to the centre of the powder-coated steel sculpture. Once drawn in, viewers are mesmerized by the sheer size of the convex towers. Standing in the midst of the plasma-cut structure that measures more than three-and-a-half metres high, the viewer gets a sense of just how powerful the magnificent animal is. Biography: Joe Fafard was born on September 2, 1942 in St. Marthe, Saskatchewan. He attended the University of Manitoba (BFA 1966) and Pennsylvania State University (MFA 1968), after which he taught at the University of Saskatchewan and at the University of California at Davis. He now works as a full-time artist out of his acreage near Lumsden, Saskatchewan. Nationally and internationally acclaimed, Fafard is one of the country’s leading professional visual artists. His awards include: Officer of the Order of Canada (1981); Architectural Institute of Canada Allied Arts Award (1987); Honourary degrees from University of Regina (1989), University of Manitoba (2007), and University of Saskatchewan (2012); Saskatchewan Order of Merit (2002); National Prix Montfort (2003); Lieutenant Governor’s Saskatchewan Centennial Medal for the Arts (2005); CTV Citizen of the Year (2006); and Saskatchewan Arts Board Lifetime Achievement Award (2007). From 2007-2009, a touring retrospective exhibition of his work was organized by the National Gallery of Canada (Ottawa) and Mackenzie Art Gallery (Regina). In 2012, he was selected to be featured on a series of postage stamps as part of Canada Post’s “Art Canada” series. Three of his artworks were featured on domestic Canadian stamps, USA stamps, and international stamps.